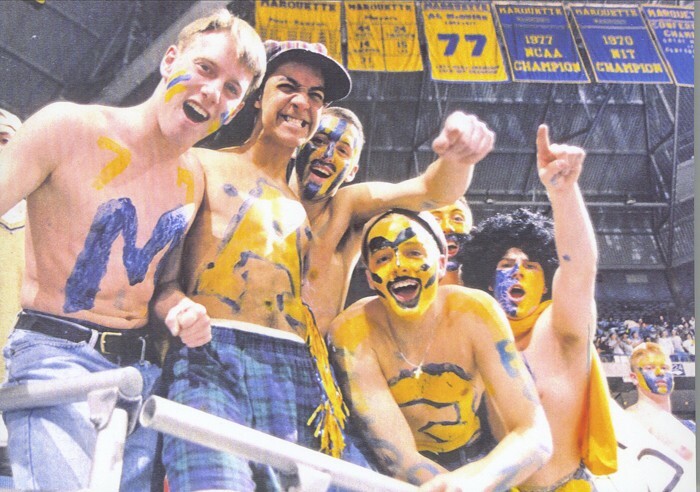 Danny Pudi, Comm ’01, (in the hat and flannel pants) dug out this photo of his Marquette days. Even though he’s busy on the set of NBC’s Community, he still makes time to cheer on the Golden Eagles. A conversation with Danny Pudi can be just as random as with his character, Abed. So here are 10 random facts about this Marquette alum and Communitystar. 1) The son of immigrants, Pudi is half-Indian, half-Polish. He used to speak Polish with his grandmother and recently did an impromptu Polish danceon The Bonnie Hunt Show. Thanks for the interview. I had no idea Danny Pudi was an MU alum. Great job on the show, Danny — Abed is our favorite character, by far! On a related note, Dan Harmon, creator of the show, went to my high school in Brown Deer, graduating the year ahead of me. He was the same in the lunch line as he was in chemistry class as he was when doing Improv at ComedySportz. And I can’t believe Dan got Chevy for the show. Abed is a great character and community is awesome. Great fanatic pic, nice touch on the blue mammary papillae — classic! Wow! Our family watches the show every week. Very funny! I had no idea he was a MU grad. The article never says ~ is he from Wisconsin? Lisa, Danny is from Chicago. Great article — glad you profiled him. I have a ton of Marquette friends who love this show. A group of us were just talking about him this weekend, in fact. It’s so fun to know Danny is a fellow Marquette alum! Way to go, Pudi! I directed Danny in a production of Godspell at the Helfaer theatre about 10 or 11 years ago. He was hysterically funny back then as well as being a generous cast member and an all around great guy. Wow. Community is my obsession at the moment. I love acting and have considered pursuing a career in dramatic writing. It must be amazing to work with such an amazing actor.